While I wait for some parts for another project already nearing completion, I'm circling back to some figures I had started in spring and hoped to have done a while back. Sometimes its a treat to pick something up and have already completed the flesh tones, and thus the basic personality is already set (if you, like me, find most of the personality of a figure to be defined by the highlights and shading of its face) and you can move straight on to picking the supporting colors. This then, is one such figure. He will find service in my Empire as a warrior priest. I have to say that this is one of the best figures I've held in my hand in a long time. Steve Buddle sculpted it just before he packed in the freelance gig and went to work for Citadel. I'm glad he got the steady job he was after, but I have to say I'm disappointed for purely selfish reasons. This was the first of a new style he was exploring- more delicate, truer proportions, and grittier, but still with his trademark clarity and smoothness; shortly after he released it he closed up shop, and thats too bad. We could have used more figures like this out there. 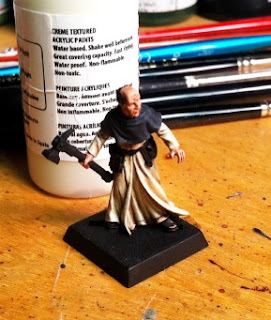 It looks like Heresy picked up most of the Spyglass 28mm resin stuff, including our clerical friend here, and infact, Andy seems to be selling them for a less than they originally went for. Which is great, because you should get one, despite the cost. Also, I apologize for the crappy camera shot. I admit, I used my phone because it seemed easier to transfer it wirelessly than it did to use my regular camera and then physically transfer the file to my desktop. My lazyness is your loss I guess. . . I'll try and get better WIP shots in the future if I'm going to bother at all. A little help here, Jonas?